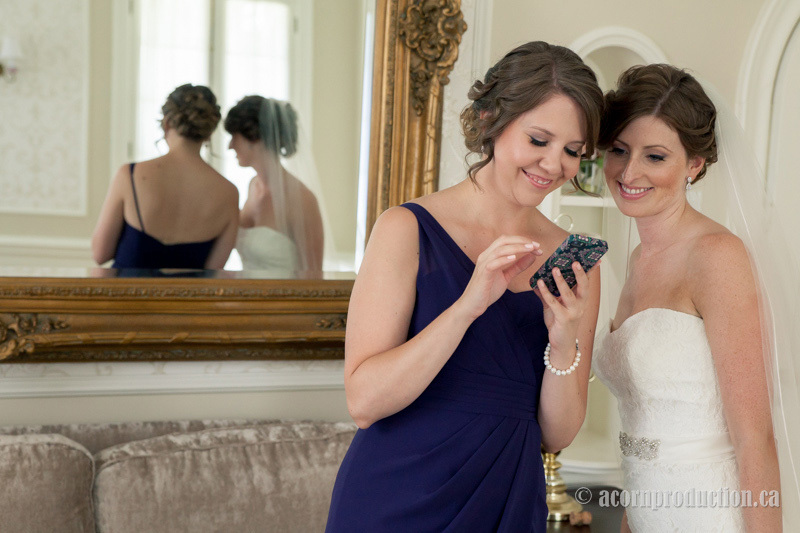 Lindsay and Joe picked the perfect day for their summer wedding at the Heintzman house. The temperature was below average for a summer month. The sky was clear with almost no cloud cover at all. The summer wedding day started off with some preparation photos at the groom's place in Woodbridge. The Heintzman house has a large bridal suite on the second floor. It is an excellent place for the bridal party to chill. It also served as a great spot to capture some preparation shots. The Heintzman house has a charming front yard with cobblestone patio blocks. During the summer the blooming flowers and the lush greenery creates a picturesque scene for an outdoor wedding. We took pictures around the venue after the ceremony. The Heintzman house is one of the oldest buildings in the Markham area. A lot of work has been done to restore the structure while preserving its historical look and feel. The wedding reception happened inside the house. The dining area has a homely and welcoming feel to it. The size this venue is ideal for small and intimate weddings with less than 100 guests.